Apple's new work on Wide Color results in lush, vibrant greens and vivid reds that today's basic screens can't even reproduce. After seeing Wide Color at work--it's currently available on new iMacs and the newest 9.7 inch iPad Pro--regular displays look flat and lifeless in comparison, much the same way that iPhone 4's debut of the Retina Display created a new "no going back" milestone in users' expectations for modern mobile electronics. The image above, created by Apple's WebKit team, appears to be just an orange square on standard RGB displays. However, from a device capable of supporting the DCI-P3 Wide Color Gamut, you can see a logo. The before and after display of Wide Color images is even more impressive when viewing vibrant landscape images. This year, it appears Apple is set to again change expectations in the realm of the colors that users see--and can capture--every day on their iPhones, despite very little being talked about color accuracy and reproduction among mobile device vendors outside of Apple. 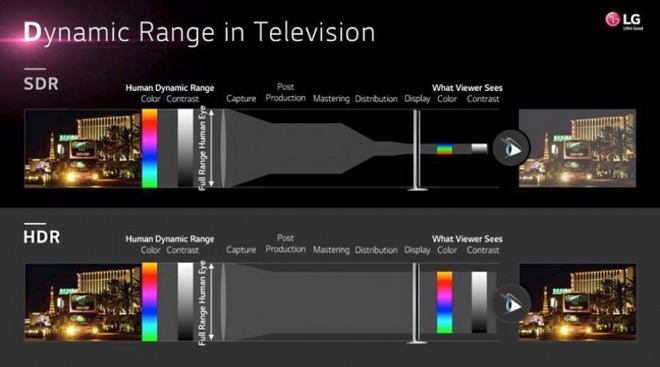 It is, however, an emerging focus among HDTV vendors, who see Wide Color as an essential component of High Dynamic Range TVs. Wide Color not just a hardware issue; it connects to production, distribution and capture. In the realm of TV, Wide Color is an industry effort. On mobile devices, it will require integration between software developers and hardware makers. The fact that Apple has already introduced Macs and iPads supporting Wide Color underlines its unique ability to deliver new technology in ways that matter, something that broadly licensed platforms--particularly value engineered platforms like Google's Android--have struggled with. Prior to Jobs' launch of iPhone 4, a variety of Android phones--such as the Motorola Atrix--were already being hyped for introducing higher resolution screens: the Atrix boasted 960x540 pixels versus the original iPhone's 480x320. There was some fudging involved to achieve that higher resolution: the Atrix and other 2010-era Androids commonly used PenTile AMOLED, a cheaper display technology that claimed a high pixel resolution despite actually supplying a third less sub pixels (by arranging more greens and fewer reds and blues). As a result, reviews described Motorola's Atrix as having "inaccurate colors and poor viewing angles, not to mention practically unreadable text at its furthest zoom." Additionally, rather than using the extra resolution to enhance the quality of the display, Android makers simply followed what PC makers had been doing with extra pixels: stretching out the 'desktop' to expand across a larger display, or scaling down the UI to fit more content on the same screen. Apple's iPhone 4 Retina Display harnessed technical progress in a new direction: it kept the user interface at the same scale and increased the pixel count four-fold, resulting in very crisp text and precise detail of everything on the screen, rendering pixels virtually invisible. In hindsight, Apple's strategy for resolution leap was obvious. However, it wasn't immediately copied. Samsung's original Galaxy Note "fablet" debuted a year after iPhone 4, but rather than similarly introducing a high quality, retina-like display, it continued to use a subpixel-fudging, cost-effective PenTile screen on a larger device, hoping users would be impressed with pixel numbers rather than caring about how pixels or color on the screen actually looked. As Rasmus Larsen noted at the time for FlatPanelsHD, "a PenTile OLED panel was recently introduced with the Samsung Galaxy Note, and we were not impressed. In real world PenTile means loss of details and sharpness, as well as a bluish/greenish tint around letters (depending on the background color)." The site also called out Google's Samsung-built Galaxy Nexus, noting that "the HD Super AMOLED display in the new Galaxy Nexus is not as awesome as it sounds--unfortunately. And the reason that people do not call it a Retina Display should seem much more obvious to you now that you know the underlying technical architecture." In the years since, Apple brought its Retina Display to iPad and to its Mac lineup. TV makers have similarly advanced HDTV sets to support "4K," making their displays four fold sharper in pixels rather than just larger. And of course, the smartphone industry now generally follows Apple in making sharper, not just larger, displays as well. Once iPhone pixel density achieved Retina Display status, Apple didn't change it again until it introduced larger screen sizes. As Android vendors have learned the hard way, arbitrarily squeezing in "even more pixels" just for bragging rights results in a new problem: a huge increase in display processing tasks that slows everything down. While iPhone 4's Retina Display involved less than a half million pixels, today's largest iPhone 6/6s Plus has to wrangle over 2 million pixels. Higher end Androids--such as Samsung's Galaxy line--pack in nearly 3.7 million pixels into a similar screen size, but have historically opted to use a less powerful Application Processor, resulting in poor performance. Rather than following Samsung in an underpowered, overspecced resolution numbers race, Apple has been working to improve future displays in ways that will actually matter to its users. One primary result is Wide Color, a new initiative to expand the color gamut of the display to cover more of visible color spectrum captured by digital cameras. That not only requires new display hardware, but also requires sophisticated color management software. Apple first delivered Wide Color support in the 5K iMac. 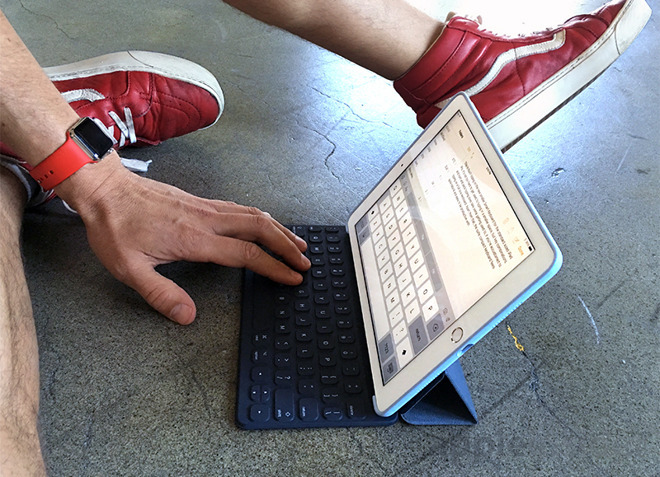 This year, it expanded support to the new 9.7 inch iPad Pro. Apple's new support for the DCI-P3 Wide Color Gamut results in an expanded ability to reproduce more accurate color than the existing "Standard RGB" can. The prevailing sRGB can't reproduce the most vibrant, vivid colors we can see. Interestingly, many cameras capture RAW color data that simply doesn't show up on today's sRGB displays. The work Apple has done to support Wide Color in both hardware and software on its 5K iMac is really an expansion of its ColorSync color management software that already existed on Macs. 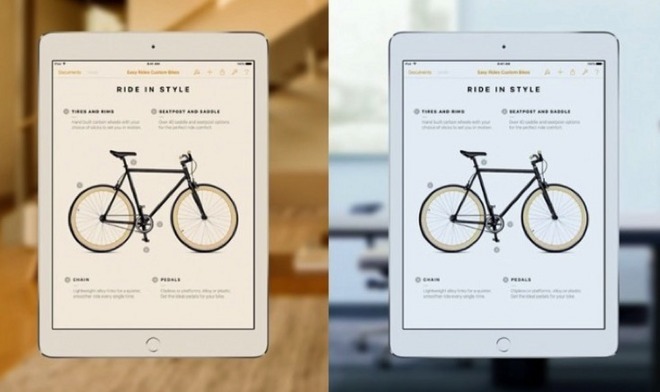 The result of Apple's work on Wide Color on iPad Pro was hailed by Ray Soneira of DisplayMate back in March. He described it as offering the highest absolute color accuracy, the lowest screen reflectance for any mobile display, the highest peak brightness for any full-size tablet for any picture level, the highest contrast rating in ambient light and the smallest color variation with viewing angle. Soneira was impressed enough to predict that Apple could implement the same Wide Color gamut and anti-reflection coating of iPad Pro on iPhone 7, noting that this would improve its screen performance and readability in bright ambient light. Apple pretty obviously didn't complete all its work on Wide Color just for one new model of iPad. Bringing support for Wide Color to iOS involved changes to UIKit, Core Animation, Core Graphics, Core Image, ImageIO, SceneKit, SpriteKit and WebKit--a major undertaking spanning much of the company's software groups. Given the attention Apple devoted to Wide Color at WWDC, it seems quite clear that Apple will also bring Wide Color, and likely a True Tone display (like the new iPad Pro, below), to iPhone 7, resulting in more vibrant and accurate color display--in apps, on the web, and even for users' existing photos--that buyers will consider a significant advance and a reason for upgrading. Both True Tone and Wide Color require extensive hardware and software integration to work. Like support for Retina Display, it also requires some attention from third party developers to make sure that the new changes are supported in their apps. That indicates that Google and its hardware partners will have a difficult path ahead in trying to close the color gap. Today, Android phone vendors hoping to stand out in a crowded market face a number of issues. Phone fragmentation--often related to the use of cheapest possible components--results in compatibility problems and makes it more difficult for Google, its hardware partners and mobile carriers to roll out new features or patch existing flaws. As noted by Phil Nickinson of Android Central, Samsung's Galaxy S7--often talked about in the media as the equivalent to Apple's iPhone 6s--is actually a brand name applied to "31 separate versions of the Galaxy S7" that Samsung sells worldwide. Nickinson was writing about Android phone compatibility with Android Auto, Google's version of CarPlay; regarding the 31 slightly different Galaxy S7 models, he noted that "Some work. And some don't." Samsung has also focused its attention on selling waterproofing claims that literally don't hold water. Joanna Stern of the Wall Street Journal attempted to carry that water herself in a piece that recommended phone buyers hold off on iPhones but not wait for a new Galaxy S7, specifically citing "waterproofing" as a key reason for buying a high end Samsung. However, both Square Trade and Consumer Reports have called out Samsung for inflating its claims of water resistance after testing multiple Galaxy S7 models that all failed to actually survive the dunk tank. Apple's ability to introduce finished technologies that work as advertised and meaningfully improve users' experience is also assisted by its global network of retail stores, where users can experience leaps like 2010's Retina Display--and this year's leap to Wide Color--for themselves.